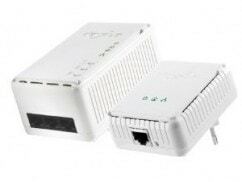 Powerline network adapters are something which we have seen a bit of here at Zath and products along the same lines are becoming increasingly common with the likes of the D-Link DHP-307AV/B 200Mbps Powerline Homeplug Network and TP-Link TL-PA201 200Mbps Powerline Ethernet Adapter starter kits. They all pretty much serve the same purpose via the same means, however when I received a review unit of the Devolo 200 AV Wireless N Powerline Home Networking Starter Kit I was actually pretty intrigued. Not only did this promise a high-speed wired network, it also claimed to provide an equally speedy wireless N access point. This is something I’ve not seen before in this type of product, so, naturally, I did the old unboxing and followed the instructions. With the units I have tested before, it has been a simple process of plugging in a pair of adapters, one attached to the router via Ethernet and the other connected to whichever device you wish. With these, however, it was not so simple. I assumed it would be, so I immediately steamed in and plugged it all in, fetched out a couple of Cat5 cables and attempted to connect to the network. No such luck. So I dug out the instruction manual, which regretfully was not a lot more than a folded piece of A3 paper full of ambiguous diagrams and a list of do’s and don’ts. In fact, there was not a single word of instruction on there, only images. So, I head on over to the Devolo website and try and get some support there, and I found some software available for Mac, Windows and Linux. I download said software and proceed to be guided through a setup which felt a little bit like driving down a road that leads nowhere. Tedious. I had to search for the dLAN adapter several times before it picked up its presence, despite it being hardwired into the machine at the time and OS X clearly notifying me of it’s existence. I persisted, entered the necessary security ID and again, it barred me from moving any further until about the five-thousandth attempt at entering the 16-digit code, when it suddenly came to life. I moved on, entered a network password, completed the guide and tried to connect to the network. Via Ethernet, fine, connects ok but without Internet access, any attempt to connect wirelessly resulted in me entering my designated password seventeen times and being refused entry each time. I retraced my steps again, and again, and again. No such luck. After about an hour and a half of this, I managed to connect. Without altering any of my methods, it simply decided to work, and at this point I realised, there is a God. So I thanked him and pressed on. To be fair, that is the hard part over. Once the network is all up and running it works great, and with there being several areas in my house where there is simply very little network signal, I tried to boost it using the Wireless N adapter on the Devolo’s. Terrific, did the job, thank you very much I can browse the web. Speeds were a little down on other parts of the house where signal is strong from the primary access point of the router, but of course that is to be expected with any network extender. I feel at this point that I may have been a little cynical in the previous aspects of the review. So, to brighten the mood let’s discuss some real positives about the kit. For starters, the adapter has a trio of Ethernet jacks, meaning you can connect a variety of devices simultaneously. For example, using a single adapter I could have a Blu-Ray player, TV and PlayStation 3 all connected to a high-speed network simultaneously, great for a home theater set up. Alternatively, a PC, network printer and NAS device could all be online. Secondly, I would like to hand it to the product designers at Devolo, who have put together an altogether attractive looking piece of kit. Some previous models I have seen have been unsightly, and if, like me, your router is in the eyeline of anyone and everyone who may enter your house, you may prefer something a little more attractive. Thirdly, and lastly, once they are setup they do actually work. You’ve got to hand it to them, it really does deliver as promised, but as I said, only after you’ve persisted with a massively frustrating setup process. 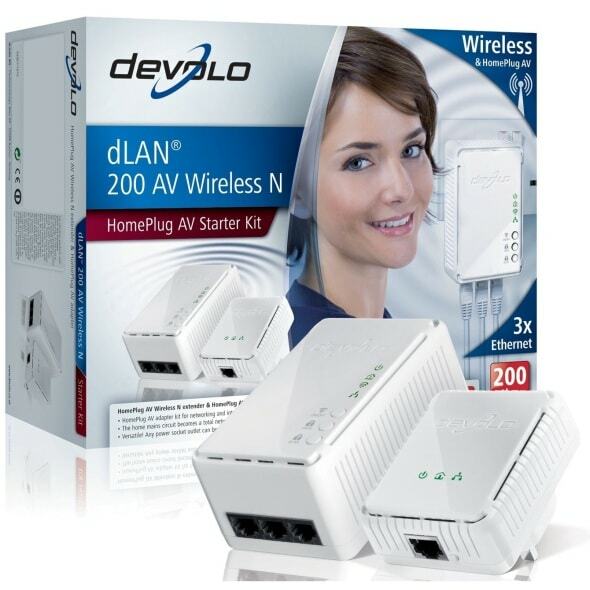 Overall, the Devolo 200 AV Wireless N Powerline Home Networking Starter Kit not a bad product. It looks great, works great and the make-up team have done an excellent job of the lady modelling the packaging. It’s really not bad, but I’m afraid a bad, bad experience of the setup process has somewhat blackened my outlook on the whole thing, and for that reason it just doesn’t stack up to the equivalent products from more major manufacturers such as D-Link. I definitely like the idea of a wireless extender built in and the three Ethernet jacks, as in other models it is definitely more functional that way than the rivals who sport just a single wired socket. However, my final judgement had to come when I saw the price. A product which demands nigh on £115 on Amazon, really should just work out of the box. Especially one of this nature, which is competing against cheaper options which simply do.